After confirming that former England international Peter Crouch is on the verge of joining the Clarets, boss Sean Dyche added that any more business was 'improbable'. 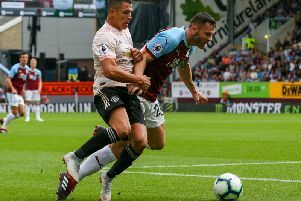 The Turf Moor chief was questioned about the club's activity with just hours of the window remaining and stated that it was unlikely that there would be any more additions. Burnley have already seen a couple of bids rebuffed for Birmingham City striker Che Adams but, with Southampton and Fulham also interested, Dyche didn't sound optimistic about having any success on that particular front. "It's improbable," he said at Thursday's press conference. "It's unlikely that anything else gets done." Confirmation of Crouch's signing is expected imminently and Dyche is delighted to snap up the striker, who has scored 108 goals in 462 games in the top flight for Stoke City, Liverpool, Spurs, Aston Villa, Southampton and Portsmouth. “I’ve known Crouchy down the years, I've always admired him, I'm not too worried about his age, we had Michael Duff, I know about his fitness and distances covered, and I think he’s got a hunger to come and make a mark. "We know what a good character he is, and he has a desire to play. The main thing for me is having motivated people." Dyche added that Welsh international Sam Vokes was also close to sealing his move to Championship side Stoke City. Vokes scored 62 goals in 258 appearances after arriving in July 2012, having netted two in nine while on loan from Wolves the previous season. He hit 21 goals as the Clarets finished second in the Championship in 2014, and 16 in 2015/16 as Burnley lifted the Championship title after relegation, finishing as the club’s top-scorer back in the Premier League in 2017 with 12 in all competitions. "I take great pride in Sam and what he has done for this club," said Dyche. "As has happened before, players move on. "He hasn't played as much as he'd like and I understand that. "It is difficult to let Sam go, but he hasn’t played as regularly and it was an opportunity for him. It could become a win-win situation."